How can the above flow be improved using Zoho? 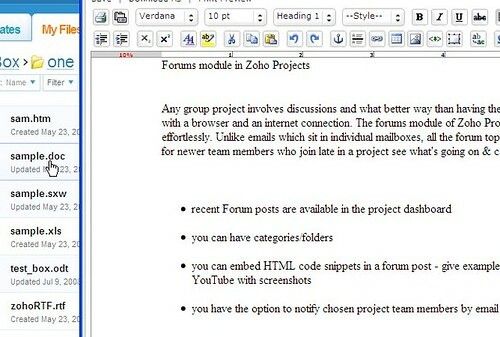 Clicking on a document will open it in the Zoho editor. Based on the file type (doc, xls, ppt etc), Zoho Writer, Zoho Sheet or Zoho Show editor will open the document. Once the document is viewed/edited and saved, the saved copy will be transferred to the enterprise document repository. As you can see, this model is a more straight-forward and an easier one. No need to download a document copy, view/edit using a desktop-based software, then upload back to the repository. There is no duplicate copy of the document created locally in the user’s machine. And most importantly, no need to install costly desktop software in each of your user’s machines. Using Zoho’s Remote API is secure. And you don’t need to have a Zoho account for each of your users. If you are planning to implement the Zoho Remote API, do write to us at api@zoho.com. 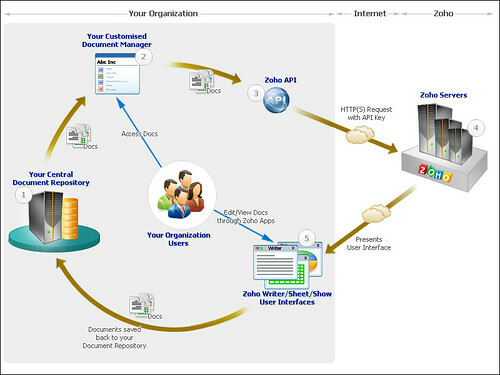 For more details, refer to the Zoho API Documentation. Related Article : An enterprise balancing act in the cloud, by Oliver Marks @ ZDNet. Central document repository is an good this for this technology, but is there any appliance features for an central apps repository. Dan : By ‘Customized Document Management’, we mean the implementation code of Zoho API that the enterprises have to write. As said in the blog post, Box.net‘s implementation of Zoho Remote API is given as an example (though box.net comes under the online storage vendor category).Nijyah : Thanks!Sjmielh : Thanks for pointing out! 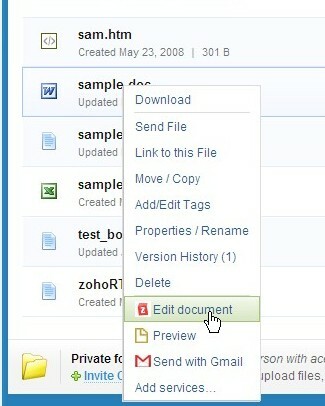 We’ll explore this option.Sam : With the Remote API, the document isn’t stored on Zoho’s servers. The document contents get rendered on the Zoho Writer/Sheet/Show editor UI and saved back to your (the enterprise’s / business’) own servers.Gabriel : Yes, Huddle is one more company which has integrated Zoho Remote API. A few others who have implemented Zoho’s API. I believe this is what the folks at Huddle are doing with their option to create a document or spreadsheet online, which can then be saved as a (shared) file within a workspace. with the zoho remote API, the document is uploaded on zoho’s servers ? I really enjoy the ZOHO Writers website. There are so many choices of writing tools to pick. What does one use for a Customized Document Management system other than write it themselves? Is Box.net enterprise solution integrated with Zoho? Thanks.